DWN Africa is an organization that focuses on renal, dialysis and transplant patients, publishes health news and healthcare jobs, international and local dialysis training, consultation services with regards to dialysis unit set up, operations and management, sales of educational, medical/dialysis equipments, medical/dialysis consumables, advert/ publicity/ promotion of organizations products and services, linking employers and employees in healthcare sector with the sole aim of bridging the gap in healthcare professional shortages, Charity & Donations for AKD,CKD & Transplant patients, and above all streamlining dialysis practice in Nigeria and Africa to greater height. 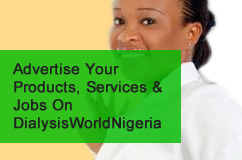 DWN Africa is a registered business entity with the Corporate Affairs Commission (CAC) Of Nigeria. DWN Africa was registered in 2012 under the Companies And Allied matters Act 1990, with Registration Number: 4626. DWN Africa is 100% Nigerian, owned by the Chairman/Managing Director (Henry Stephen Ugonabu & Maryrose Uchechukwu Muoka) and in partnership with Dr. V. Barseghyan, Engr. G. Sargsya, Mr. S. Madu amongst many others. DWN VISION To be the best and preferred platform linking dialysis and transplant patients with products & services providers, employer of labour with health care professionals, international and local dialysis trainers with trainees in Nigeria, Africa & beyond, assisting dialysis and transplant patients through charity & donations. DWN MISSION To ally with our local and foreign partners/ counterparts towards streamlining the practices of dialysis in Nigeria, Africa and beyond to greater height.